lt;stronggt;RCPST12EPLWHlt;/stronggt;lt;BR/gt;Defenders Biohazard Step Can, Square, Steel, 12 gal, Whitelt;BR/gt;Rest assured you'll have maximum control of infectious waste and odor. Handsfree unit includes leakproof rigid plastic liner and gasket rim that confines odors. Self-closing lid with full piano hinge won't flip back when opened. Steel retainer bands secure poly bags inside. Nylon glides protect floors. Waste Receptacle Type: Biohazard Cans; Material(s): Steel; Application: General Waste. 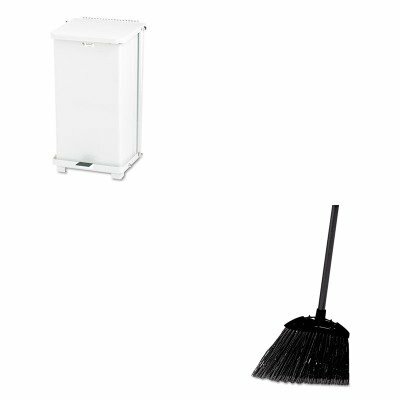 ~ Includes one waste receptacle.lt;BR/gt;lt;BR/gt;lt;stronggt;RCP637400BLAlt;/stronggt;lt;BR/gt;Defenders Biohazard Step Can, Square, Steel, 12 gal, Whitelt;BR/gt;Cut and shaped for easy sweeping in hard-to-reach areas. Flagged, acid-resistant polypropylene fill bristles. Will not stain, discolor or absorb odors. Can be used wet or dry. Overall length 35amp;quot;. Application: Spot Bristle Material: Polypropylene.